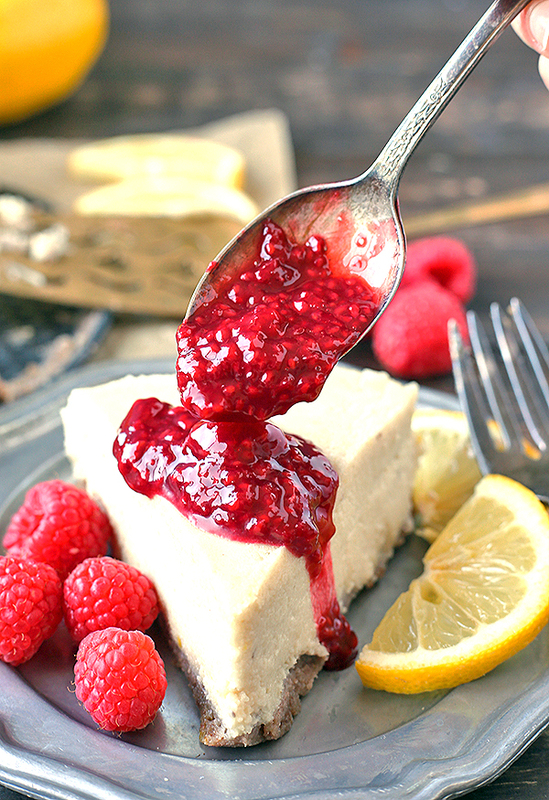 This Paleo Lemon Cheesecake is a healthier cheesecake made with no dairy and is naturally sweetened. 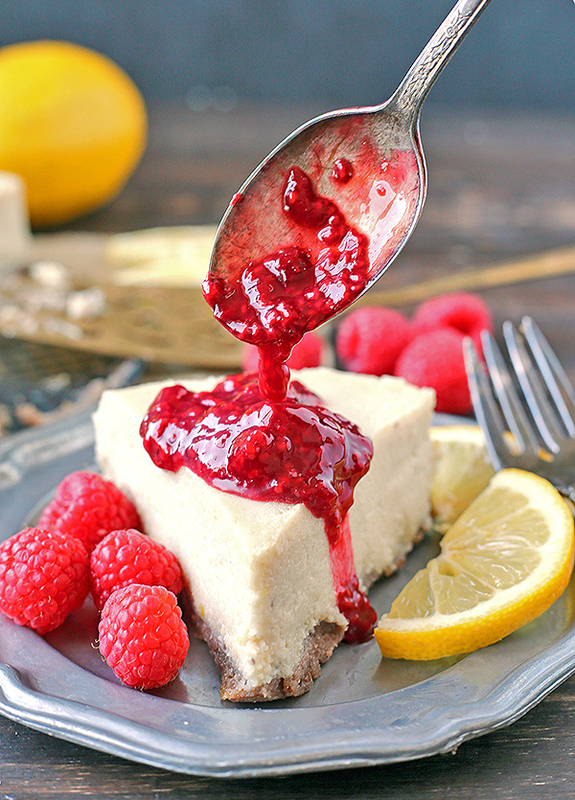 A pecan and date crust topped with a thick, rich layer of lemon cheesecake that has a cashew base. Gluten free, dairy free, and naturally sweetened. I used to make a mean cheesecake. It was one of the first things I taught myself how to bake when I was a teenager because I loved it so much. I got pretty good at making them, but since we’ve given up dairy I haven’t made a traditional one at all. I thought my cheesecake days were over. I must say I was little skeptical that cashews could produce that creamy, smooth cream cheese-like texture, but they do! I did make some paleo cheesecake brownies, but this is my first “official” paleo cheesecake with a springform pan and pretty slices. I decided on lemon because it is one of my favorite flavors and this does not lack in lemon flavor. It is good plain, but I added little raspberry jelly just for fun. 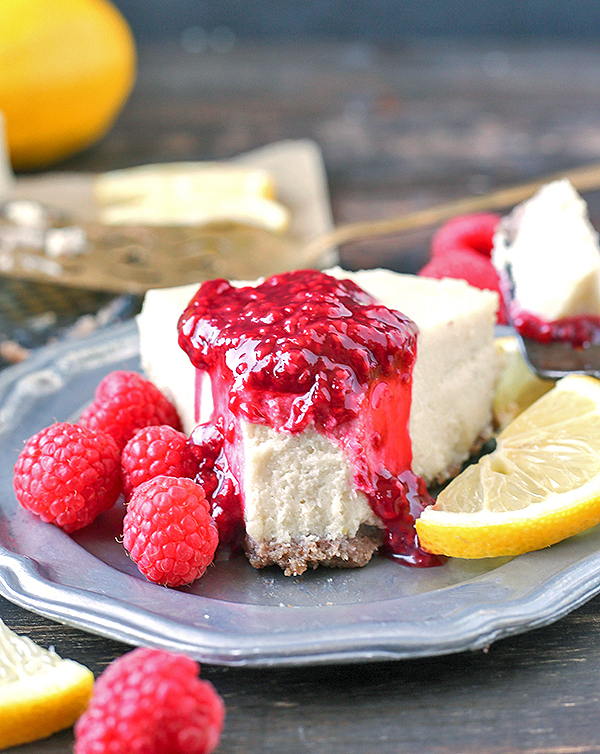 Fruit over cheesecake is always delicious. You will need a 7 inch springform pan to make it exactly the same. You could also make it in an 8 inch square pan lined with parchment, but there is something so nice about the traditional round cake. And I promise more cheesecakes will come so the pan will get use! 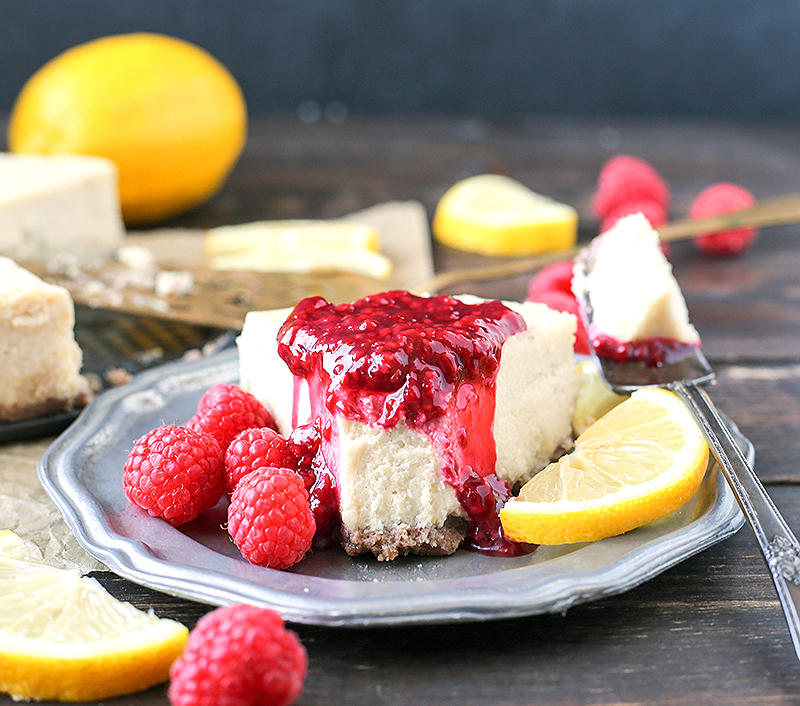 This cheesecake is no-bake which is super nice, but it does need to be stored in the fridge or freezer. The fridge will keep it soft enough to eat immediately whereas the freezer will keep it more firm and you’ll have to set it out for a little while to thaw. -Completely dairy free, using cashews as the base. 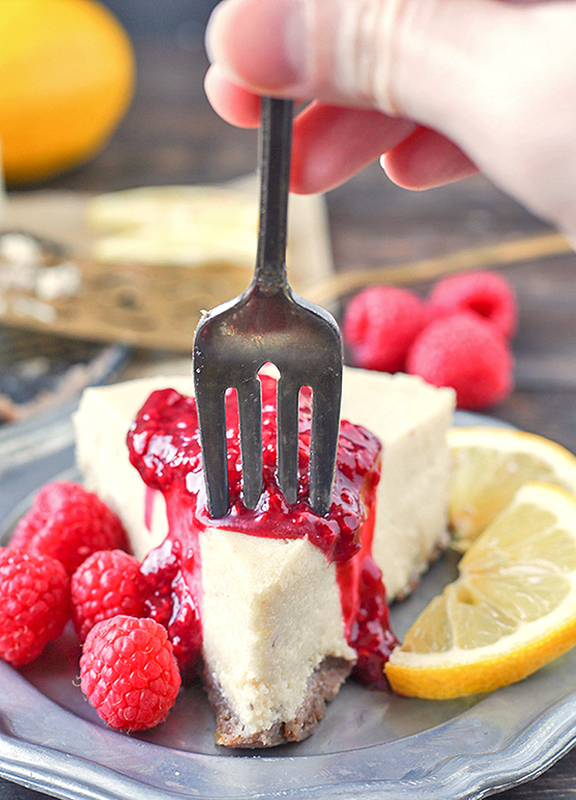 -Easy and no-bake! Just a high-powdered blender or food processor and about 20 minutes total. 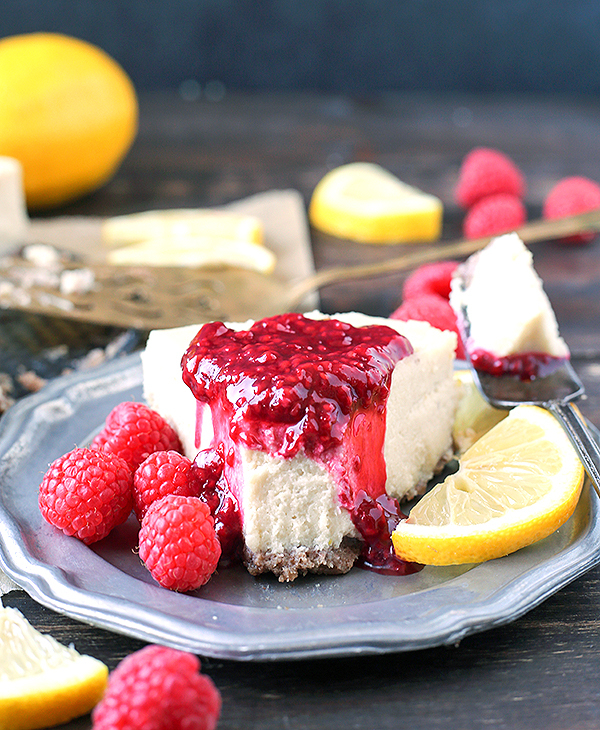 -It is incredibly smooth, creamy, and sweet- just like traditional cheesecake! 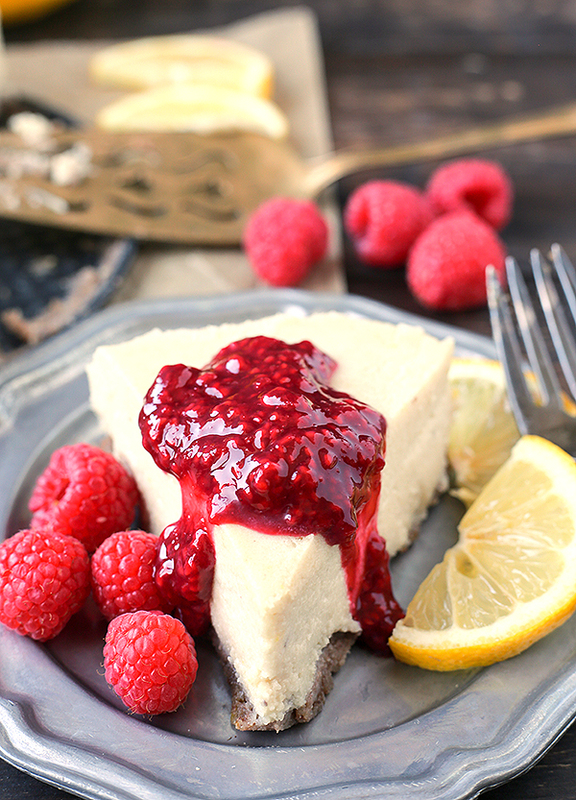 You will love this cheesecake because it is full of lemon flavor, easy to make, and sweet! Such a light, perfect for spring-time, recipe. HERE is the pan I use. HERE is the food processor I use. *The night before or early the same day, soak the cashews. Place them in a bowl and cover them with filtered water. If in a hurry you can soak them in hot water for 1 hour, changing the water half way through to keep warm. Grease a 7-inch springform pan and set aside. In a high powered blender or food processor, make the crust. Add the pecans, dates, salt, and lemon juice to the processor and blend until fully combined. This may take 1-2 minutes. It should hold together like a cookie dough ball. 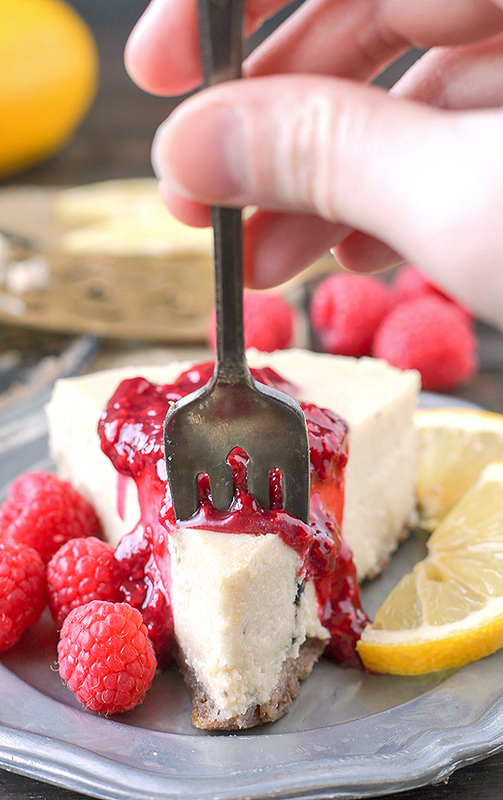 Press into bottom of springform pan and place in the fridge while you make the cheesecake. Drain and rinse the cashews. Place them in the food processor- no need to wash it from the crust unless it's very dirty. Add in the coconut oil, almond milk, honey, salt, lemon zest and juice. Blend on high until completely smooth, stopping and scrapping down the sides as needed. This may take 5-7. Once completely smooth, pour over crust and refrigerate until firm, about 4 hours. It can also be kept in the freezer, but will need to thaw a little before serving. I can’t have cashews or almonds, have you tried or recommend any other nut? Hi Sheils- you can use any nut for the crust. For the filling, you can try macadamias, but I haven’t tried it personally so I can’t say for sure.